☆ STAY VISIBLE IN THE DARK AND LOW LIGHT CONDITIONS. 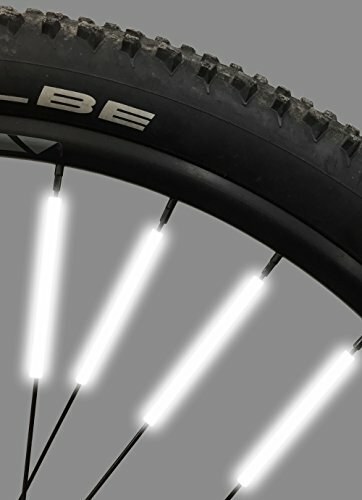 The highly visible reflective coating on each of our bike wheel reflectors reacts with halogen car lamps and handheld torches to illuminate your presence on the roads making you more visible. Our bike wheel reflector reflect white light even from 200 yards away and are clearly visible even in low light conditions. ☆ PERFECT FOR KIDS BIKES TO KEEP THEM PROTECTED. Cycling is a great way for your kids to get out of the house and stay active, especially during school vacations. But keep them safe and protected is quite essential. So you can use our bike spoke reflectors on your kid's bikes too. Cheap safety bike accessory for kids! One pack of 36 pieces will provide complete coverage for a standard kids bike to cover the front and rear wheels. ☆ 100% MONEY BACK GUARANTEE. Enjoy 100% cash back against manufacturing defects. Also, in the unlikely event that you are not satisfied with the product we promise to give you your money back 100% within 30 days from your purchase. Contact us directly for the refund or replacement. If you have any questions about this product by Jusmar USA, contact us by completing and submitting the form below. If you are looking for a specif part number, please include it with your message.